AIDS activist group ACT UP organized numerous protests on Wall Street in the 1980s. The group's tactics helped speed the process of finding an effective treatment for AIDS. Demonstrators from the organization ACT UP protest in front of the headquarters of the Food and Drug Administration. The FDA opened up access to experimental drugs soon after. December 1989: At left, members of ACT UP mount a protest outside St. Patrick's Cathedral in New York. At right, activist Michael Petrelis inside the cathedral shouts "Stop killing us!" in the middle of the service. There are more than half a million people in the United States with HIV who are being kept alive today by drug therapy that was discovered back in 1996. 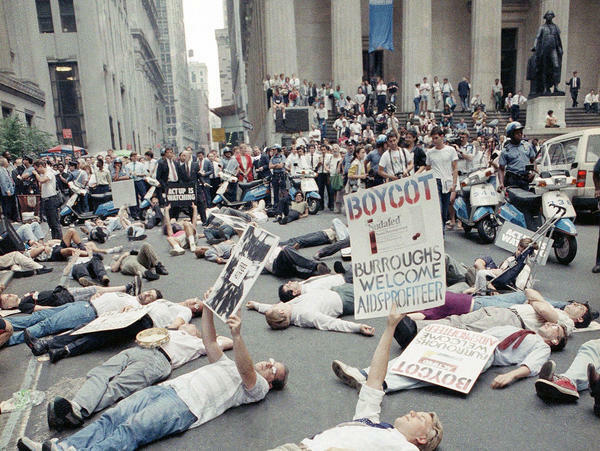 Many attribute that breakthrough to pressure that was put on the government by a group of activists called AIDS Coalition to Unleash Power, or ACT UP. As part of an NPR series exploring the power of anger, NPR's Nurith Aizenman explains how these early-age activists used anger to force change. NURITH AIZENMAN, BYLINE: Michael Petrelis' first act of protest was in the doctor's office. It was 1985. Petrelis had just been told he had AIDS and he had two years to live. He was 26. MICHAEL PETRELIS: And I break down crying. And I took out a cigarette. AIZENMAN: Because he knew it was forbidden. PETRELIS: I was so mad with hearing this news, so angry at the doctor, I thought the one best way to protest would be to light up a cigarette and just smoke it with as much pleasure as I could find. AIZENMAN: But soon, his rage shifted as he began to learn how little the government had done to address a crisis that was still mostly affecting men who, like him, were gay. This was four years after AIDS first made headlines. More than 6,000 Americans had already died. PETRELIS: I mean, my anger just knew no limits. AIZENMAN: David Barr was another young gay man living in New York, grappling with this new disease. He was too overwhelmed to dwell on his anger. He was just out of law school and part of a network of volunteers helping people with AIDS. DAVID BARR: It was a war zone. Like, I don't have time to go yell at politicians, you know? I got to diaper somebody. You know, I've got to create a legal services program to keep people from being evicted. BARR: It was never satisfying because whatever help we were providing was really temporary. You know, we lost everybody. AIZENMAN: By early 1987, the threat felt apocalyptic. UNIDENTIFIED PROTESTER: What do we want? UNIDENTIFIED PROTESTERS #1: A cure. UNIDENTIFIED PROTESTER: When do we want it? AIZENMAN: Hundreds of gay men and their supporters began taking to New York City streets in shows of anger. UNIDENTIFIED PROTESTERS #2: (Chanting) Health care is a right. Health care is a right. PETRELIS: Screaming at the top of their lungs, I felt they were taking my anger and putting it out there to the world. AIZENMAN: For Barr, the young lawyer, it was galvanizing. BARR: The anger helped us fight off a sense of hopelessness. AIZENMAN: Soon, all over the country, thousands were joining up. They called themselves AIDS Coalition to Unleash Power, ACT UP. DAVID FRANCE: ACT UP ethos was that they had united in anger. AIZENMAN: David France is the author of a history of ACT UP called "How To Survive A Plague." The demonstrations you've been hearing are excerpts from a 2012 documentary he made by the same name. FRANCE: The task of ACT UP was to take that anger and turn it into action. They were no longer invisible sufferers of a disease. They were terrifying sufferers of a disease. AIZENMAN: And they started using that power very strategically. What ACT UP wanted was a cure, so they took it upon themselves to figure out the specific roadblocks in government policy and in clinical trials, then unleashed their anger to force the decision-makers to the table. UNIDENTIFIED PROTESTERS #3: (Chanting) Release the drugs now. Release the drugs now. AIZENMAN: It kicked off in 1988 at a government building in suburban Maryland. BARR: Our goal was to seize control of the FDA. AIZENMAN: David Barr says they wanted the Food and Drug Administration to give AIDS patients access to an experimental drug. The FDA wouldn't even discuss it. UNIDENTIFIED PROTESTERS #3: (Chanting) Guilty, guilty, guilty, guilty. AIZENMAN: The activists laid down in rows, blocked entrances. It made national news. UNIDENTIFIED PROTESTERS #3: (Chanting) Seize control, seize control, seize control. AIZENMAN: Within days, the FDA agreed to meet. In a couple months, officials opened access to experimental drugs. 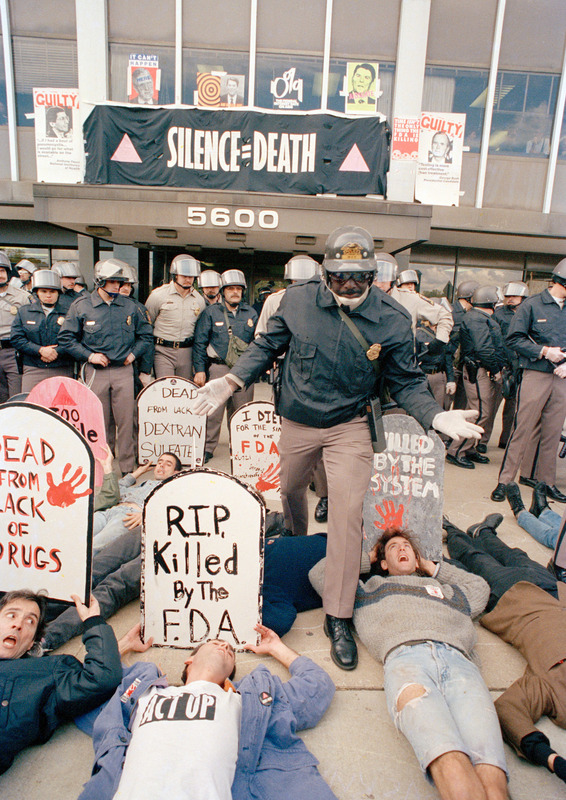 Next, ACT UP took on the National Institutes of Health, then the pharmaceutical companies. Here's France. FRANCE: What they were able to revolutionize was really the very way that drugs are identified and tested. AIZENMAN: Fast-tracking drug trials, getting the government to set research priorities such that in 1996, scientists finally found the treatment that would keep people alive. France says there's no question ACT UP sped up the breakthrough. But along the way, the anger that propelled ACT UP became a source of division. AIZENMAN: It all came to a head one Sunday in December of 1989 at Manhattan's St. Patrick's Cathedral. UNIDENTIFIED PERSON: ...The prayerful atmosphere. AIZENMAN: ACT UP wanted to call out the archbishop, John O'Connor, for the church's opposition to condoms. Petrelis was in a group that decided to take the protest inside. He'd been raised Roman Catholic, had a lot of unresolved feelings towards the church. PETRELIS: You know, condemning me as gay - just all that Catholic guilt I had been raised with. PETRELIS: Something inside of me - I feel there's just not enough anger that could be heard. AIZENMAN: He had a whistle on his keychain. He started blowing it. PETRELIS: Loudly, stood up on the pew, literally blowing the whistle on centuries of horrible treatment by the church toward gays and toward women. AIZENMAN: Even that didn't feel like enough. Then, Petrelis pointed his finger at Archbishop O'Connor. PETRELIS: I started screaming, stop killing us. PETRELIS: (Screaming) Stop killing us. Archbishop O'Connor, stop killing us. AIZENMAN: Others took up the call. UNIDENTIFIED PROTESTERS #4: (Chanting) Stop it. Stop it. AIZENMAN: An activist lined up for communion took the wafer from the priest and crushed it. BARR: This story on the front page of the papers was not, you know, look at these horrible HIV policies that the church is promoting. It was, you know, gay guy spits body of Christ out on the floor. AIZENMAN: Barr felt the time had come to expand ACT UP's appeal. Now, this action against the church had alienated potential supporters. BARR: It was a turning point where venting one's anger took precedent over political strategy. PETRELIS: It was a catharsis finally happening. AIZENMAN: And not just for the activists in the cathedral. He's been in movie theaters when David France's documentary has been shown. When that scene comes on of his younger self screaming at the archbishop, people stand up, he says, and they applaud me. Nurith Aizenman, NPR News. Transcript provided by NPR, Copyright NPR.